During the last ten years, many dairies have implemented more intensive programs for the feeding of their dairy replacement heifer calves. There have been numerous publications that have shown the benefits of feeding higher volumes of milk and milk solids to dairy calves in order to improve growth rates as well as their resistance to disease. The data also show these programs decrease costs due to lower morbidity and mortality, reduced usage of antibiotics, reduced labor, and improved feed efficiency, in addition to the increase in milk production. However, along with these intensive programs have come some new challenges in maintaining the quality and consistency of the milk fed to dairy calves. If the dairy is feeding whole milk, it still may have numerous sources. The milk may originate from cows being treated for mastitis, cows that are in the hospital being treated for other diseases or on withhold after being treated with antibiotics, cows that are recently fresh and not ready to be put in the tank yet, cows that are injured and have not been treated with antibiotics, high somatic cell count cows, and milk directly from the bulk tank that is saleable. Whole milk is normally 29-30% fat and 26-28% protein. However, it is obvious that if the source is from some of these previously mentioned, the fat, protein, and solids can vary significantly, and may or may not contain antibiotics. This results in enough variation that may have an adverse effect on the digestive system of the young calf. The Brix refractometer is commonly used to determine the solids content of whole milk. It is generally recommended to add two points to the value received on the Brix scale to determine the percent solids. For example, if the number received is 10.5, 2.0 would be added to that so the percent solids would be 12.5. Even though nothing but whole milk is being used on the farm, it is still important to check the percent solids on a daily basis, to make sure that there is no significant variation. It is a common practice to flush the hospital lines with water after milking the cows. This water sometimes ends up in the hospital milk and has a tremendous effect on the percent solids in the final product. Hopefully, the whole milk that is being fed to the calves has been pasteurized, especially if mastitic milk is being used. Many dairies try to time milking in the hospital with the time the calves are being fed so the milk is being fed soon after the pasteurization process is complete. The advantages of this approach are: The milk is warm at the time of feeding (it should be around 105 degrees Fahrenheit) and there is less chance of bacterial growth in the milk prior to being fed. If feeding milk from the bulk tank that is already refrigerated, it is important that the milk is warmed up to the desired temperature for feeding. If not, the calf expends body heat to warm the milk in its digestive tract before it can be digested. This is a huge cost of energy to the calf, especially in the winter, and will result in slower growth rates and increased cold stress. If the dairy is only using waste milk, it is common that the solids may be less than 12.5%. In this case, a commercially available powdered milk balancer may be used to increase the solids content. A Brix refractometer should be used to monitor the solids content of the milk before and after the addition of the milk balancer. The milk balancer can also be used to increase the solids content of the milk if so desired. Increasing the milk solids will result in higher growth rates. Milk solids can be increased safely to 15 to 16% without causing an osmotic diarrhea. However, poor-quality products with higher mineral content may have to be fed at a lower rate to prevent loose stools. Dairies in colder areas often feed milk at a 14% solids because of the increased demands for energy during colder weather. In most cases the dairy will not have enough waste milk to feed their calves, leaving several options. One is to use saleable milk from the bulk tank, and the other is to add either a milk balancer or milk replacer to the milk to increase the volume. 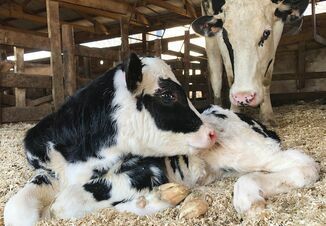 If the dairy owner prefers not to use saleable milk, there are two major variables that will complicate the process of having enough milk to feed the calves. The amount of non-saleable milk varies from day to day depending on how many animals are in the hospital. Also, the number of calves being fed milk varies depending on the number of calves born and the calves that are weaned. Therefore, the majority of dairies will have to deal with mixing different volumes of non-saleable milk and powdered milk every day. This process can be complicated and requires a well-trained employee who has the ability to perform this mixing process, making sure that the volume, temperature, and percent solids are consistent from day to day. If the dairy chooses to use milk replacer, there are numerous manufacturers and formulas to choose from. Recent research favors higher-protein milk replacers that are 25 to 28% protein, with all the protein coming from milk sources. Fat levels are usually in the range of 18 to20%. Recently, some new formulas have come on the market that are quite high in fat, around 30%. 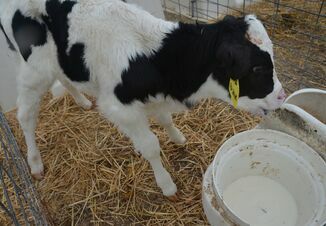 Young calves from birth to three weeks of age do not have the ability to utilize soy protein so it should never be used in calves of this age. Soy protein is less expensive and is utilized to reduce the cost of the milk replacer; however, it is also less digestible and the efficiency of converting soy protein to growth is less than if the source of protein is milk products. Maintaining the percent solids on a consistent basis for milk replacer can be difficult. The first issue is the dilution factor in milk. The directions on the bag may be something like use one pound of milk replacer per gallon. This does not mean to add one pound of powder to one gallon of water. It means that the total volume of milk replacer powder and water should equal 1 gallon after mixing. This mixing error would result in a product that is 10.7% solids, versus 12.0% solids if mixed correctly. Another common error if mixing larger volumes is adding one bag of milk replacer for every 50 gallons of water. This results in the same mixing error as previously explained. If the percent solids desired is at least the same as whole milk, then the amounts mixed needs to be changed to get the solids content up to at least 12.5%. Many dairies are now feeding an increased level of solids to improve growth rates and reduce disease incidence in the calves. It is important to use a Brix refractometer to accurately determine the percent solids in the final mix. However, it can be somewhat of a challenge when testing milk replacers. Because of the different sources of products in the milk replacers, and the differences in percent protein and percent fat, the reading on the refractometer may be different. For this reason, the dairy should generate a standard curve for each milk replacer they are using. The easiest way to do this is to buy an electronic digital kitchen scale that can be read in grams. Add 80 grams of milk replacer (MR) to 920 grams of water (8.0% solids), mix and take a reading on the Brix refractometer. Plot this on a piece of graph paper with the percent solids on the X axis and the Brix reading on the Y axis. Repeat this same process with 100 grams of MR and 900 grams of water (10.0% solids), 120 grams of MR and 880 grams of water (12.0% solids), 140 grams of MR and 860 grams of water (14.0% solids), and 160 grams of MR and 840 grams of water (16.0% solids). You can also plot these numbers in an Excel spreadsheet and then generate the average linear line of these plotted points. The reading received when checking the mix in the future can be plotted on this average line to get an accurate number on the percent solids of the mixture. The water should be 110 to 120 degrees Fahrenheit when generating the standard curve, and also when mixing the milk replacer for feeding the calves. Part 2 of this series will cover mixing and feeding procedures to help ensure consistency.